This our last weekday in Danang and with some things not open on the weekend, we had many places to visit today. Our prearranged itinerary has been thrown out the window and we started prioritizing over breakfast. Marissa’s brother Ri slept on his overnight 12-hour bus ride to Danang and had taken a taxi from the local highway to his mother’s home and was there before we arrived mid-morning. 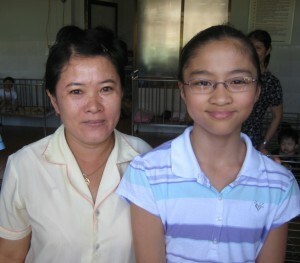 His wife, Giang, is pregnant and stayed back. One of Ri’s childhood friends joined us from the area as we sat around a table and many chairs at Hoi’s house that had probably been gathered from the neighbors. Chris had brought gift bags for Ri, Giang, Hoi and her mother. Hoi gave Marissa a nice little watch which, coincidentally, was the same gift we had given them. Once again under the watchful eye of the entire neighborhood gawking from the porch. We were pleased when Hoi, Ri and even his friend expressed interest in joining us for our day’s touring. As we all trudged up the path to the car, Ri showed Marissa a half-decade old picture of her he keeps in his wallet. This was a proud big brother. Our first stop was to the closest elementary school. 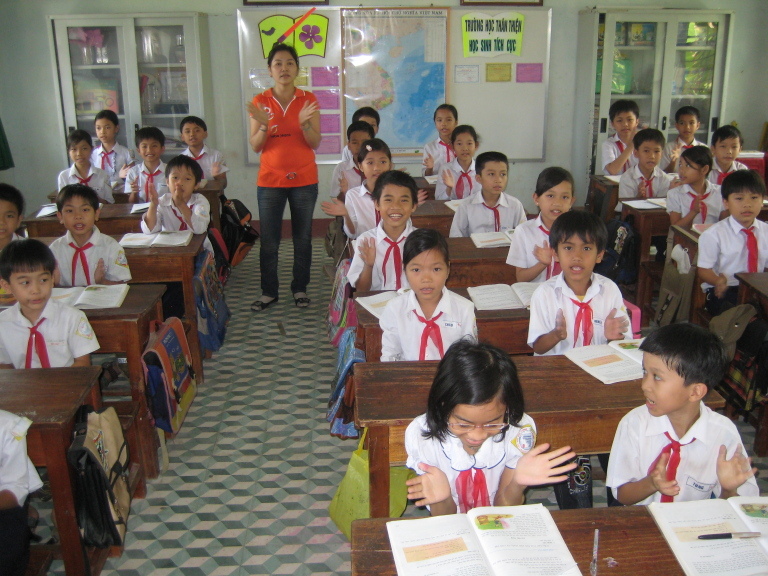 While we waited in the van, our guide went in to explain to the Vice Principle that an American couple and their Vietnamese daughter wanted to see a local school and to our surprise, he yes on the spot. He ushered us from the courtyard to a room of fourth graders that were learning English. The teacher encouraged us to ask questions of the neatly uniformed students and Chris stepped in when Marissa demurred. Although they had trouble understanding our questions, they had no problem understanding the pencils and candy we had for them. They sang us a nursery rhyme in English before we left. We were swarmed by schoolchildren in the courtyard as we boarded the car. We had lunch at a nearby restaurant Ri picked out. We all had the same regional delicacy: rice noodle soup with chicken, peanuts, corn, sprouts and dash of lime. A thin, crisp, rice and sesame tortilla was crumpled on top. I enjoyed it, but had no skill in eating soup with chopsticks; although I have to admit I was a little put off with the bones still in the chicken. Marissa, would dislikes anything spicy, was a trooper even eating a few noodles. 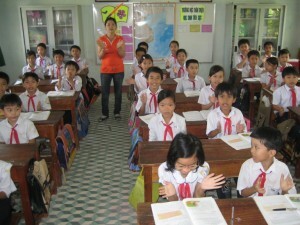 Our last big desire while we were in Danang was to see the Red Cross orphanage. The orphanage that was home for Marissa 11 years ago had been destroyed by a natural disaster and a much nicer one was built in a different location in 2006. Since Chris had provided the address and phone number months ago, our tour guide was able to call ahead this time for an appointment. At the front door we were greeted by a half dozen barefoot caregivers. We also took off our shoes before entering. A dozen so bassinets surrounded the room and they were now caring for special needs children. Hoi handed me a little boy with a “LIVE STRONG” T-shirt who proceeded to play with my goatee. He obviously had never seen anyone with one. I don’t think I’ve seen any men in Vietnam sport a goatee or beard. Besides this guy was surrounded by women all day. How exciting for Marissa. She looks VERY happy for this experience! How is everything in Upper? The posts have been wonderful Ken. We want to hear from Chris! Please tell us what you are feeling Chris, you know, Mom’s perspective. And hugs to Marissa. We are very proud of all of you. The odds of convincing my wife to post to this blog are infinitesimally small. She didn’t start reading this blog until yesterday.